What percentage of my marketing budget should I allocate for online marketing? One question that many new marketers -- and even veteran business owners -- have is how much of their marketing budget should they allocate for Internet marketing. Luckily, search engine optimization works hard to make sure that you don't have to spend a lot of your budget on online marketing. However, methods like Pay Per Click still require a decent amount of money to be beneficial. The goal of your online marketing campaign is to grow a community to help your social media presence and website content to convert visitors into revenue for your company. Additionally, social media optimization is a very important aspect of a successful online marketing campaign. Here are some things you should look at. spending goes. Therefore, if you have a budget solely for online marketing, you should allocate around 50-60 percent of that towards your PPC campaign; it is what will bring a return on your investment in a timely manner. Second, you should allocate 20-30 percent of your budget towards social media optimization since social media is a very important aspect of your marketing campaign. In fact, your customers are more likely to visit your social media pages over your website or blog. Therefore, your social media pages should be professionally maintained, designed and operated, with plenty of information for customers. 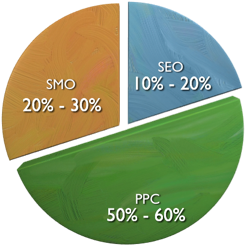 Third, your search engine optimization should take 10-20 percent of your budget. The reason why you do not need to invest too much money in your search engine optimization is because the best strategies are virtually free to utilize -- unless you hire a company to help with your campaign. Even still, many SEO companies are relatively inexpensive, so you should not have to allocate much of your budget towards it. Additionally, you may want to hire an SEO company to help you with your campaign since Google has changed their algorithm methods to focus on content over other factors that can easily be manipulated, which is why there were so many spam sites appearing high in the search engines in the previous years. Ultimately, you know what you want for your business, and you probably have your convictions on what methods are the best for marketing. You may not believe that most of your budget should go towards Pay Per Click ads or social media optimization. Therefore, you should consider your personal goals when determining your budget for your Internet marketing campaign.